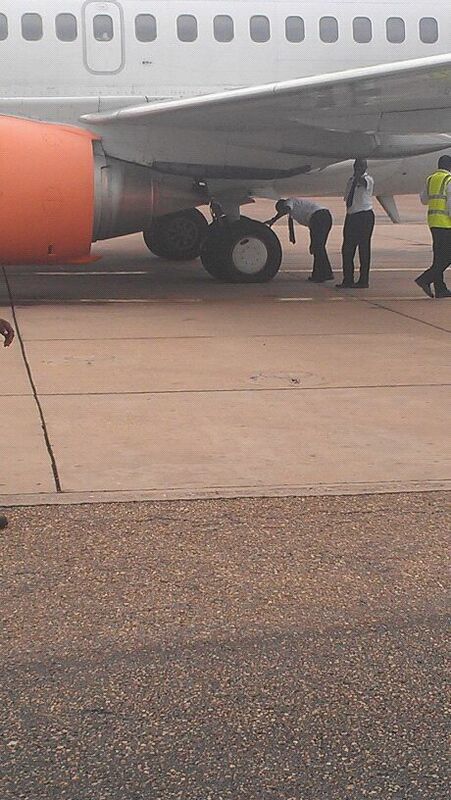 A BRIEF OF THE UNFORTUNATE EVENTS WITH AERO AIRLINE FROM ACCRA ON 18/06/12 | Thoughts of a Calabarboy. 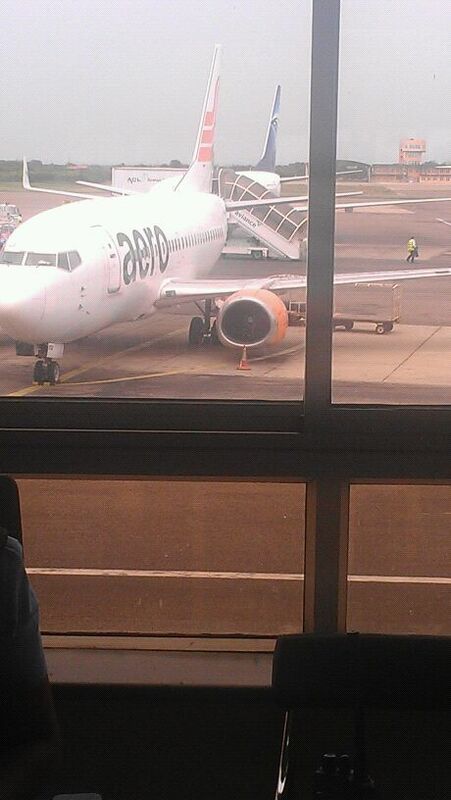 A BRIEF OF THE UNFORTUNATE EVENTS WITH AERO AIRLINE FROM ACCRA ON 18/06/12 – Thoughts of a Calabarboy. 7:55am: Engaged flight attendant on why take off has not been announced and was told they were waiting for some documentation. 8:05am: Pilot announces all passengers to disembark due to a flat tire. 8:35am: We are told a replacement tire has been requested from Lag and will be accompanied by two engineers on Air Nigeria flight to arrive 10am. When we asked why they couldn’t engage a local KLM engineers, we were told it is Aero Airline’s policy not to use any other engineers but Aero’s. 11am: Aero Station Manager informs that Air Nigeria flight was delayed in Lagos due to Aviation Fuel issues. 5:15pm: Booked a new 7pm flight on Aero to Abuja since I missed my connecting flight earlier in the day. After we had returned to the boarding gate, and endured a false call for boarding about 30 mins later, I decided to take a walk closer to the glass partition separating boarding gates 3 and 4. I was struck by who I saw on the the other side (Gate 3). My friend Mohammed Mijindadi, was at Gate 3 waiting to board the delayed Arik flight from Accra to Monrovia. Equally amazed to see me so far away from Abuja, where we both live, we made our way to meet at the waiting area and exchanged sober pleasantries. Sober because he had just lost nine 9 family members in the Dana Airline crash a fortnight ago; his sister and her husband, their four kids, his mum, and two cousins. I looked at him intensely, he stared back and just smiled. I was speechless and we just hugged and let the heart talk. Why would I see Mohammed at a time as this, when we just escaped being carried in a similar vehicle going somewhere to crash. I could read all kinds of meaning into this spooky encounter, but I hold my peace and determine that I will not be silent about the state of transportation in Nigeria. Nigerians simply have to become empowered citizens. It was a passenger who noticed the flat tire and complained, if not we would have been consigned to a highly risky flight. we cannot afford to be negligent any more or having an anything-goes attitude. We must ensure that vehicles we board, whether it is air, land, water, or supernatural transport :P, we must ask questions if we notice anything or feel uncomfortable with the state of the vehicle. By the time we were boarding the flight again, everyone had become airline inspectors, looking to be sure that the tires were properly screwed in :D. I tell you I sat in a plane full of empowered Nigerians. Everyone seemingly had a clear resolve to become more sensitive to issues of airline safety. The Downside? – Watsed a whole day and missed two important meetings and got my money stuck with Air Nigeria for a connecting flight I missed. ← LEAVE YOUR KIDS ALONE! lol @ supernatural transportation. But seriously, we can’t afford to exercise negligence and nonchalance on any level any longer. A long day it must have been for you, oh dear! I think we are at a point in our history that if things like this doesn’t change our attitude, nothing ever will. Thanks for sharing. We need to do this more oftwn. great post. so so sorry about your friend’s loss. such a sad and tragic story. i think of the family everyday since the news broke and can only pray that the good Lord heal and comfort them. Glad to hear you made it back home safe. the lord deliver us from wicked, corrupt, selfish and completely clueless leaders that do not understand the magnitude of their non chalant actions and lack of concern for others they are supposed to protect/represent. Thanks Sis! I was quite a sobering experience when you are directly involved with a potential mishap. Very valid point Orok. However, in the absence of such an efficient you prescriptively describe, I will rather be vigilant to the extent of my awareness and seek to know more where I can, so I can ask valid questions. Sigh! We will continue to play russian roulette. It’s our way. Instead of solving these problems we buy private jets. Fix our roads we by the slickest army armoured SUVs, invest in healthcare we send our patients abroad and invest in foreign doctors!!! I was talking to this guy in Accra who is into purchasing aircrafts for individuals. He said since the Dana aircrash, the demand for private planes have increased in Nigeria. Think about it! Nice one Reggy,I honestly don’t want to imagine how I would have felt if I were one of d passengers,the fact dat a passenger noticed and not even aero workers shows another slack and negligence on their own part,no value for human lives,so yes,I agree with you,passengers should check d safety of d cars,airplane,any means of transportation they board,but ultimately may God continue to keep and protect us. NB:I wonder why we are not hearing anything again about d investigation of dana crash ooo,I wonder wats happening to d investigation?? ?our so called leaders have a way of covering things up especially when it doesn’t affect them directly. God heal our nation!!! Thank God for journey mercies… There really is a need to act upon ideas but how? In Nigeria, where NOTHING absolutely nothing is guaranteed. My heart still bleeds for the love that was passed away unknowingly. Furnished with this data, My partner and i recently got many links. You may not find out this particular, nevertheless there are actually providers that will allow you to get a url i its web sites. I purchased i url for $20 per month, an additional for $75 per month. Christopher Newport School as well as Hampton School as well simply call the vicinity dwelling. Business travellers may employ our home’s achieving space or the on-site Organization Center, in addition. Whilst in the location, intend to travel through Newport Reports to help Colonial Williamsburg. Made by hand paper retailers are selling best man-made reports using numerous forms such as soft silk paper, synthetic leather paper, all-natural paper, moonrock as well as flower paper. Made by hand reports are more appealing as well as abundant texture and consistancy causes it to be distinct from the device produced paper. They’re manufactured from tree-free fabric like abaca as well as hemp. and say I truly enjoy reading through your posts. Thanks a lot for sharing this with all folks you really understand what you are speaking approximately! amateurs singing songs they should not be singing, and we shamefully mutilate a few ourselves.